In recent years there's been a dearth of great places to have lunch downtown, with most of the hot lunch action taking place on the east side of the river. Not that I'm complaining, mind you, since that's my side of town, but when there are friends on the west side with prescribed lunch hours, it'd be nice to have someplace decent to drop into. 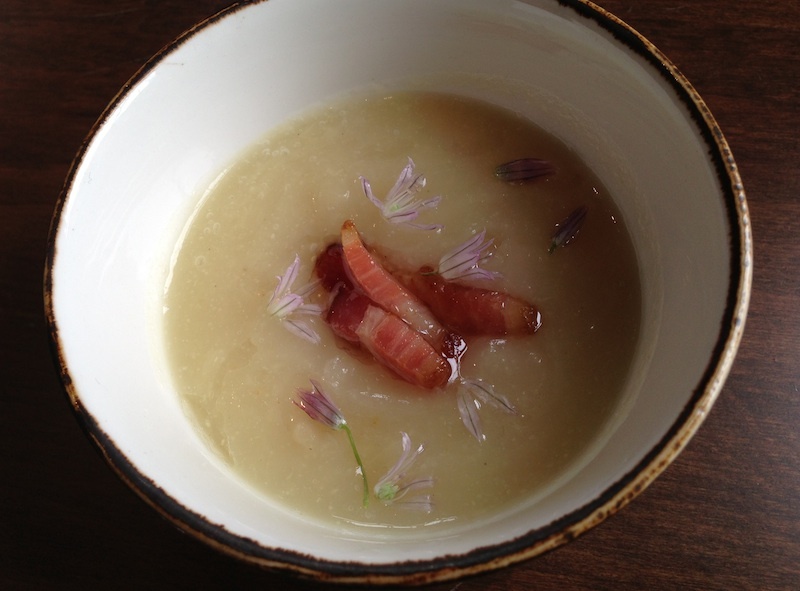 Perfect celery root soup with lardons, chive blossoms. 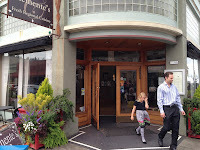 Fortunately for downtowners, there's more than just Clyde Common and Higgins for a nice-to-fancy spot for a business lunch, a meet-up with your auntie or just a soup-and-sando with a friend. And since it's located in one of downtown's oldest buildings, a former stable for city father William Ladd's horses, Raven and Rose provides plenty of fodder (ha!) for conversation. 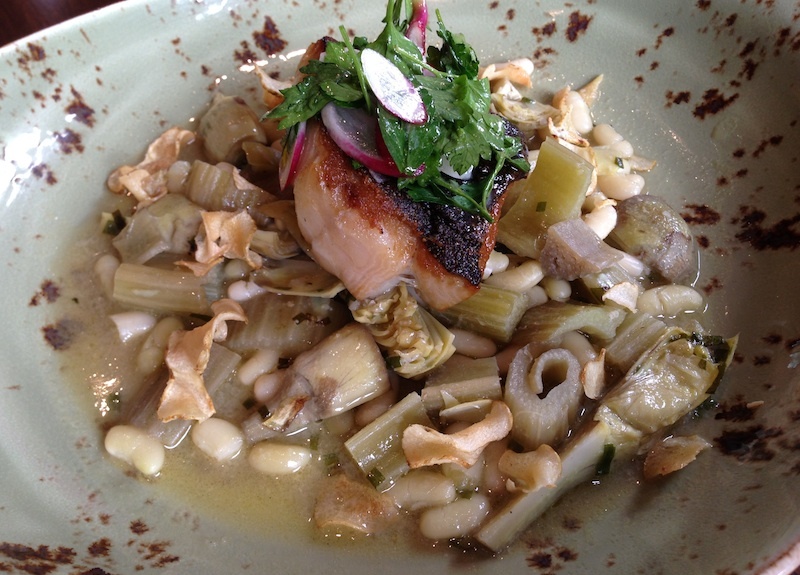 Open less than six months, R&R's menu offerings, under the direction of Exec Chef David Padberg, are coming along nicely, with the intimate dining room opening for lunch just a week ago. Lunch revolves around a selection of soups and salads, a few sandwiches and a sampling of larger plates with staples like fish and chips, shepherd's pie, a couple of seafood options and a pasta dish that are augmented with Padberg's stable of seasonal vegetables and greens along with herbs from his prodigious garden. 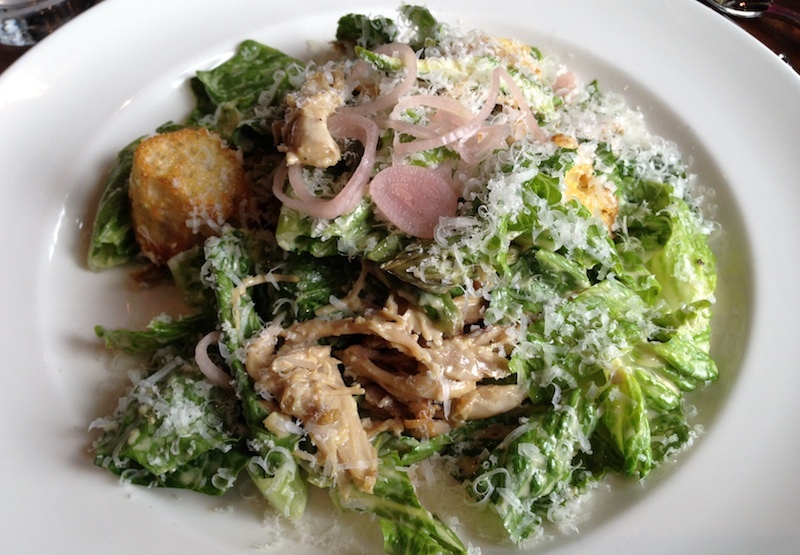 The rabbit Caesar I ordered was spot-on, the rabbit, sourced from a small local farm, braised to fall-apart perfection and shredded over a bed of tender local greens. My friend's black cod was similar to the version found on the dinner menu, roasted and placed on top of cannelini beans, chard stems, celery and wild mushrooms. I couldn't resist ordering a rhubarb phosphate, though I was tempted by the anise spritzer that was also on the non-alcoholic beverage list. 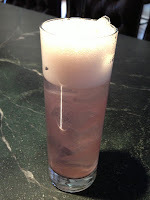 There is, of course, a complete menu of fully-leaded cocktails, wine and beer available, but I like the seasonal sodas that Padberg and Dave Shenaut, R&R's bar director, are developing, a category that isn't often found on PDX bev menus. Next time I'm going for the fish and chips, since I'm obsessed with finding a decent representative of that most quintessential pub grub, and the burgers and fries ordered by other patrons looked luscious. Comfortable and clubby inside, with outdoor tables ringing the building on sunny days, this is a nice place to spend even a short lunch hour. It can be said, without equivocating in the least, that I adore sushi and its riceless cousin, sashimi. They would be my choice for breakfast, lunch and dinner if it was possible. Though I'm married to someone who, while he enjoys it on occasion, is just not as cuckoo as I am for these articles of Japanese cuisine, which means lunches are a good time to head out for a fix. 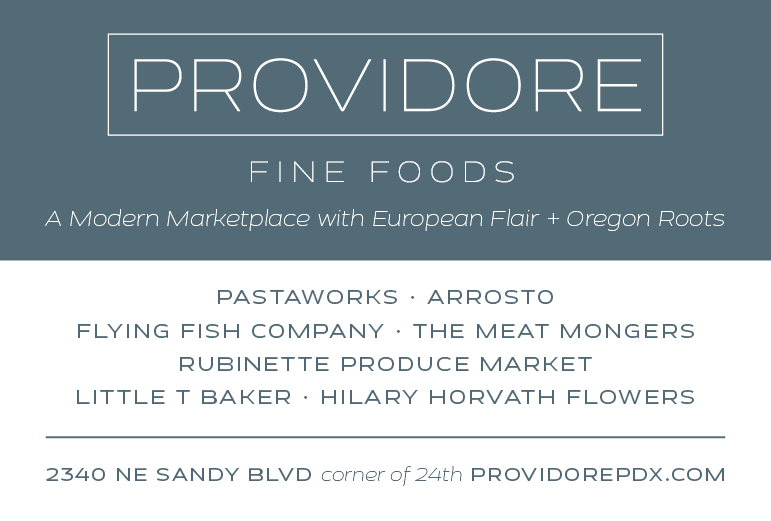 There are several good places to experience this food in Portland, though it's slow going getting around to them due to the (mostly justifiably) pricey tabs that can be run up sampling this and that. Mirakutei, just over the bridge from downtown on East Burnside, is a little hole-in-the-wall spot to do just that. It's built its reputation on ramen, but I found both the sushi and sashimi to be moderately priced and cleanly made, with super-fresh fish that was beautifully and simply presented. Well worth checking out, especially on week days. 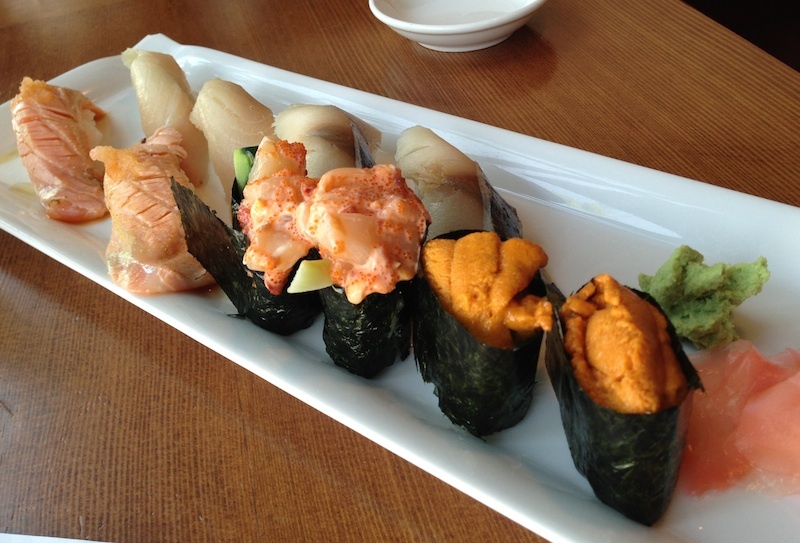 Details: Mirakutei, 536 E Burnside St. 503-467-7501. Tables of steam trays, racks of meat under heat lamps and baskets and bowls heaped with pastries and out-of-season fruit have always puzzled me as a solution to a holiday breakfast. Maybe it's that Grannie and Uncle Henry and the nieces and nephews can all find at least one thing in the pile they'll like, but, really? Call us fogies, but we rarely go out for a traditional brunch or even for breakfast, preferring to sit and sip our coffee, read the paper and maybe have toast or an omelet, all in the comfort of our jammies and slippers. So on Mother's Day, when the males in the household said we were going to go on a road trip dubbed the Magical Mother's Day Mystery Tour, especially when it was mentioned that the dogs would be coming with us, I was in. Without a blindfold, it was pretty obvious when we hit Highway 30 that we were heading for the beach, so when we pulled into Astoria around one-ish I was more than ready to fill the gaping hole that had opened up since toast and coffee earlier that morning. 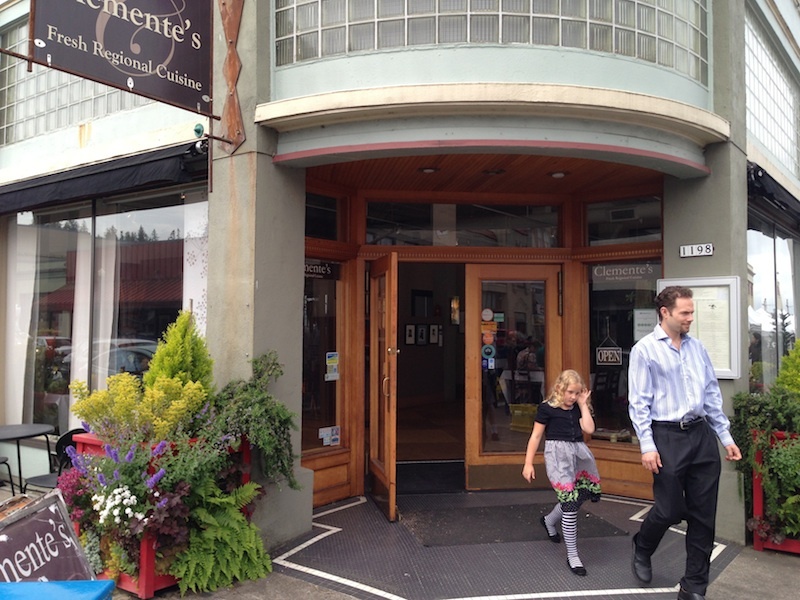 Fortunately, we pulled up in front of Clemente's, the refreshing addition to Astoria's previously moribund dining scene, a place where seasonal and local rule and ingredients are treated with knowledge and respect. 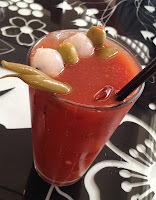 It was a casual, order-off-the-menu brunch-or-lunch scene with not a steam table in sight, and I exercised my mother's privilege of ordering a Bloody Mary made with house mix and home pickles, followed by a half dozen local oysters. 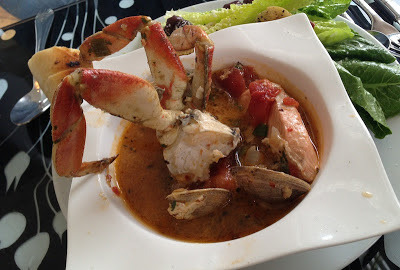 They needed just a couple of drops of lemon before being consumed, and then my crab Caesar arrived with a pile of Dungeness smiling up at me from the plate. Though Dave hit the jackpot with his seafood-alicious cioppino (top photo), crammed with salmon, oysters, scallops and crab. 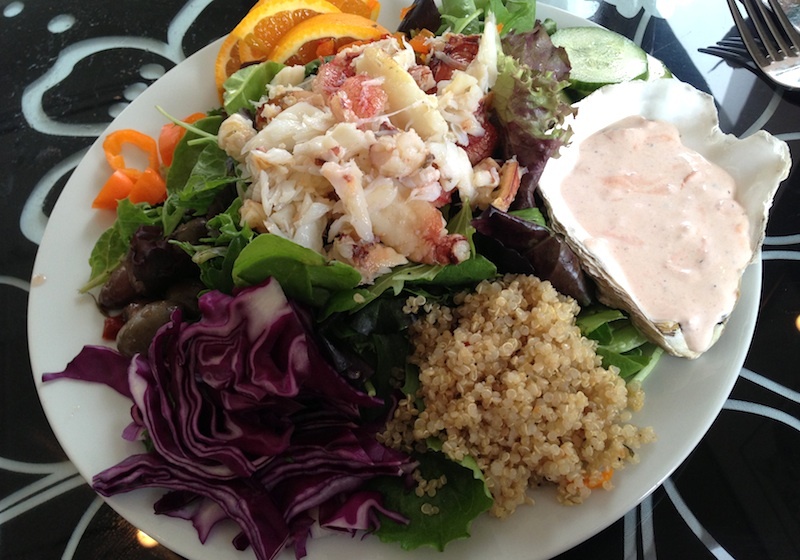 Other than a puzzling spoonful of quinoa on one side of my salad, it was a particularly satisfying way to celebrate the holiday, especially since it was followed by a romp on the beach and a (for me) sleepy ride home. Details: Clemente's, 1198 Commercial St., Astoria. 503-325-1067.